Trick or Treat! 5 Halloween Sleep Tips! 1. Carve out quiet time: If your child is still of a napping age, prioritize the afternoon rest that day to ensure your child is refreshed and ready for an exciting evening. And, whether or not your child is still napping, try to implement an afternoon of quiet time (think books, quiet colouring, puzzles, etc.) leading up to the big, exciting night ahead, so your child does not begin the evening already overtired and overstimulated. 2. 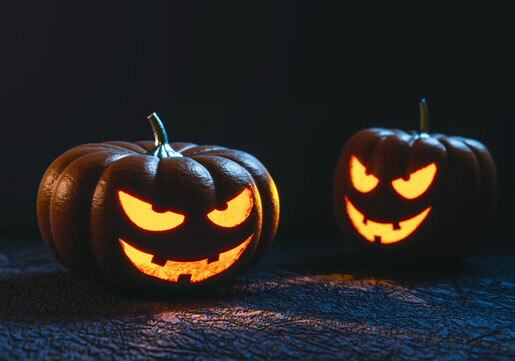 Brew up a plan: Figure out your start time, your trick-or-treating route, and your end-time before Halloween hits, and share your plan with your child. Of course, you will need to make this discussion age-appropriate so your child has a good understanding of how the night will unfold. Children respond very well when they know what is coming up next, but do not generally like surprises in their scheduling. Knowing what the plan is, including what will be expected of them once the evening is over and you have returned home (read: bedtime!) will help the transition from trick-or-treating to hitting-the-hay much more smooth. 3. Treat your family to an early start: In many cities, provinces, and states, it is already dark by 6pm at this time of year! So, no reason to wait until well-past your child’s bedtime to get started with your Halloween fun. Start your evening early (particularly with very young children who still need quite an early bedtime), so that you are perhaps only about 30 minutes late for your child’s regular bedtime. This will help to avoid the extreme over-tiredness that can often lead to bedtime battles and night wakes. 4. Limit the sweets (to some degree! ): Candy is a virtual inevitability on Halloween, but allowing your little one to consume loads of sugar on the trick-or-treating trail, or dig into their candy pile once you’ve returned home directly before trying to put your child to bed, is likely to lead to a wound up little zombie come bathtime! I suggest limiting candy that evening to 2-3 treats, and then saving the rest to be dispersed over the coming days (or weeks!). Another favourite in our home is the “Switch Witch” – my daughter picks a certain number of treats to keep and leaves the rest in a pile on our kitchen table; overnight, the Switch Witch replaces the pile with a fun toy or new book! 5. Don’t let your bedtime routine get spooked: A proper bedtime routine (bath, PJs, book, bed) is important on every night of the year, in order to help your little one’s body and mind prepare for what is coming up next (a big, long sleep! ); however, it’s even more important on “off” nights when your regular schedule or activities have been thrown off by something super exciting like trick-or-treating! So, though it may be tempting to skip the routine on this special night, don’t! A very quick bath or at least a warm wipe-down with a cloth to simulate a bath will signal to your child that normalcy is coming back into place after an evening of utter stimulation! Follow this with snuggling up for a quick book, and then have your little one down not TOO far past their regular bedtime for a great night of sleep after a fun-filled day of spookiness.